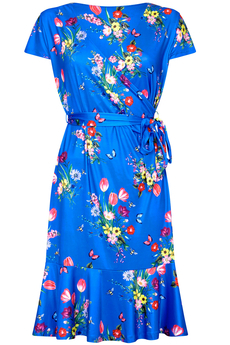 Tulip Bouquet Slinky Jersey dress in gorgeous bright cobalt blue color is an essential piece for a day-to-night look. Made from lightweight stretch silky-feel jersey, has a classic fixed wrap-front, frilled hemline and cute cap sleeves creating a chic and feminine silhouette. Is adorned with multi color floral bouquets print and comes with a self-tie sash-belt. It simply slips on, it is not lined and is approx. 95cm in length. New Summer 2019 collection. Composition: 90% Polyester, 10% Elastane. Color: Bright blue.